I know we just had a nice vacation but don’t you still feel like getting out of town? And wouldn’t you know that most of us can’t so I’ve been pretending in my bathroom with OLA HAWAII’s Pineapple Lime Cane Sugar Scrub. Not only does the Hawaiian cane sugar physically exfoliate but the papaya fruit and other natural enzymes help to exfoliate, while the organic Lehua (a Hawaiian island) honey, virgin coconut butter, coconut oil, Aloe Vera, Mango Seed Butter, and Kukui Nut Oil just to name a few, soften the skin nicely. How could you not want to try this one? $24/11.2oz @ hawaiianbodyproducts.com. Who doesn’t daydream of a trip to Hawaii? 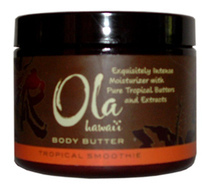 Now you can bring the spirit of the state to your bath with the OLA HAWAII line. Each of the nine products is based on the Hawaiian concept of well-being. Each paraben-free product uses botanicals, essential oils, fruits and sea elements among other tropical elements to clean, nourish and pacify the soul and body. Our pick of the litter has to be the Cane Sugar Scrub ($25/11.8oz). Using sugar and alpha hydroxyl acids, this one will exfoliate and totally soften your skin. If you need extra moisture after the shower, then indulge in their rich Body Butters ($25/4.8oz). These seem to really utilize Hawaiians natural resources. Macadamia nut, avocado, kamani nut, kului nut and virgin coconut oils really feed skin while the papaya seed and passion fruit extracts deeply penetrate to keep skin smooth longer.